The American TFP > Catholic Perspective > Can Ecumenism Justify the Pope’s Celebration of Luther’s Revolt? 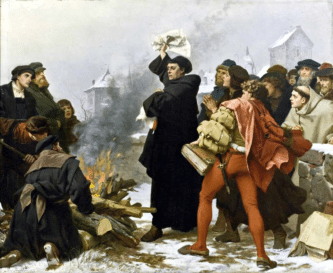 Can Ecumenism Justify the Pope’s Celebration of Luther’s Revolt? Can a theory change the historical reality of the facts? Can a theory be true if it contradicts the reality of the facts? In line with this judgment of Luther, Pope Francis will join the celebrations for the quincentenary of Luther’s revolt, traveling to Sweden in October. Indeed, the “manifesto” in which Luther proclaimed his revolt against Rome in 1517, known as the “Ninety-five Theses” against indulgences, is of a theological nature. If the Church had accepted Luther’s “reform,” it would have resulted in the destruction of the Catholic Church as Our Lord Jesus Christ founded it with the Apostles and was sanctified by the martyrs and confessors. the Sacrament of Matrimony, marital indissolubility (with acceptance in certain cases of bigamy and adultery). How Can a Pope Celebrate Such a “Reform”? From what we have seen above it is clear that a Pope, the head of the Catholic Church and representative of Jesus Christ on earth, could not join the joy of those celebrating the revolutionary act of an enemy of the Church. Unless otherwise noted, all emphasis is our own. See, for example, Walter Cardinal Kasper, Martin Luther: An Ecumenical Perspective, (Paulist Press, available December 6, 2016). Catholic News Agency, “Full text: Pope Francis’ in-flight press conference from Armenia,” available at http://www.catholicnewsagency.com/news/full-text-pope-francis-inflight-press-conference-from-armenia-45222/, retrieved September 20, 2016. Gian Mario Gillio, “Francesco: ‘Le intenzioni di Lutero non erano sbagliate’” available at http://www.riforma.it/it/articolo/2016/06/27/francesco-le-intenzioni-di-lutero-non-erano-sbagliate, retrieved September 20, 2016. Léon Crisitani, “Réforme,” in Dictionnaire de Théologie Catholique, t. XIII, 2, col. 2027. Hartmann Grisar, S.J., Luther, Volume I, (London: Kegan Paul, Trench, Trubner & Co., Ltd., 1913), p. 331. Available at https://archive.org/stream/grisarsluther01grisuoft/grisarsluther01grisuoft_djvu.txt, retrieved August 6, 2016. Erwin Iserloh, “Martin Luther and the Coming of the Reformation (1517-1525),” in History of the Church, Vol V: Reformation and Counter Reformation by Erwin Iserloh, Jospeh Glazik, Hubert Jedin, , (London: Burns & Oates, 1980), Part I, Section 1, Chapter 3, p. 50. Dr. Van Lees, “Martin Luther said that justification by faith alone is ‘the article upon which the church stands or falls’ (articulus stantis et cadentis ecclesiae),” in “Justification by Faith Alone: The Heart and Essence of the Gospel” available at http://covenantofgracechurch.org/justification-by-faith-alone-the-heart-and-essence-of-the-gospel. Luther, Heidelberg Theses, No. 13. “Free will, after the fall, exists in name only, and as long as it does what it is able to do, it commits a mortal sin.” http://bookofconcord.org/heidelberg.php. Cf. J. Paquier, “Luther,” in Dictionnaire de Théologie Catholique, t. IX, 1, col. 1229. M. Luther, Werke, (Weimar Edition), 56, 272 & 513; Cf. Erwin Iserloh, Jospeh Glazik, Hubert Jedin, Reformation and Counter Reformation, (London: Burns & Oates, 1980), p. 27. 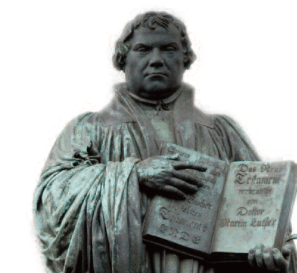 Martin Luther, The Babylonian Captivity of the Church – A prelude 1520, 3.8, at http://www.lutherdansk.dk/Web-babylonian%20Captivitate/Martin%20Luther.htm, accessed January 28, 2016. “Let Your Sins Be Strong: A Letter From Luther to Melanchthon” Letter No. 99, August 1, 1521, From the Wartburg (Segment) Translated by Erika Bullmann Flores, from: _Dr. Martin Luther’s Saemmtliche Schriften_ Dr. Johannes Georg Walch, Ed. (St. Louis: Concordia Publishing House, N.D.), Vol. 15, cols. 2585-2590, http://www.iclnet.org/pub/resources/text/wittenberg/luther/letsinsbe.txt, retrieved September 3, 2016. Encyclical Editae Saepe, May 26, 1910, No. 9, http://w2.vatican.va/content/pius-x/en/encyclicals/documents/hf_p-x_enc_26051910_editae-saepe.html. This entry was posted in Catholic Perspective and tagged 99 Theses, condemned, ecumenism, Exurge Domine, heretic, Luther, Martin, Pope Francis, Pope Leo X, Protestantism, Sweden by Luiz Sérgio Solimeo. Bookmark the permalink.